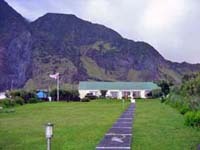 Progress with repairs to the damage caused by the 2001 Tristan da Cunha hurricane, and the role of the Tristan da Cunha Disaster Fund. Readers may recall the gripping account of events of 21 May 2001 when the strongest winds in living memory struck the Settlement, leaving a trail of disaster in their wake. 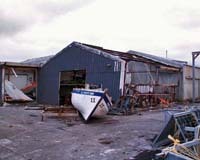 The scale of the damage was frightening: everywhere, electricity poles broken and wires down; heavy longboats tossed into gardens as if by a giant hand; substantial damage to both the hospital and the Prince Philip Hall community centre; warehouses and storage sheds wrecked; and hardly a house roof remaining intact. Not a family was left untouched. The only relief was that no-one sustained serious injury, hard to believe considering the amount of wreckage and debris strewn around. Three years on, the scene is totally transformed. Lots of hard work and community effort, funded by generous support to the Disaster Fund, have worked wonders. Essential services were speedily restored, however, the main electricity transmission line is now underground. (Can you ‘bury’ a ‘live’ cable? - answers to the Editor on an Island postcard!) The hospital has been repaired and re-equipped, and a bigger, better Prince Philip Hall is scheduled for a grand reopening in September. 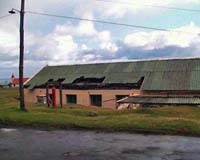 A grant from the Department for International Development paid for repairs to government buildings and stores. The experience gained from these works inspired the community to embark on a much-needed programme of replacing household roofs throughout the Settlement. 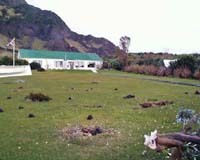 The corrugated sheeting, introduced on the Island when sufficient materials for the original thatched roofs were no longer available, had proved dangerously inadequate. During the storm, these thin sheets were shredded and ripped off, with sharp-edged pieces slicing through the air with lethal force. The ambitious roof replacement programme is now two-thirds complete, with visible and obvious benefits to the families concerned. A bonus is a number of Islanders who qualify for PhDs in roofing! And talk about speedy. They can have your old roof off, and it’s long lasting, galvanised waterproof replacement up, almost as quickly as the Wimbledon ground staff get the covers on Centre Court ! (Well, almost…!). Anthropologist readers will be interested in the evolution of a new Island custom. It has become a tradition, on installation of a replacement roof, to stage a topping out ceremony to mark completion of the work. A ‘flag’ is flown. Perhaps I can leave it to the collective imaginations to guess which item of female wearing apparel thus flutters immodestly in the breeze? The Disaster Fund Committee is now embarking on a final fund-raising effort in order to complete the household roofing replacement programme by the close of our Quincentenary year in December 2006. Fortunately, we do not have any labour costs: the workforce is made up of volunteers from the Community. Thus the major budget items are the roofing materials themselves, which must be ordered and shipped from Cape Town . Costs average about £1,500 a house, and our target for the “Keep ‘Em Flying” Fund amounts to a total of £45,000.